Recently, one of my favorite restaurants, The Farmer’s Daughter had a cooking class featuring Summer Salads. The class was a lot of fun, even if I’m not usually a big fan of these types of foods. At the event, she gave us some recipes and then explained her (rather organic) process of putting them together. The one thing I didn’t like about the class was that I forgot to bring my camera, so I couldn’t take photos of the food for this post. 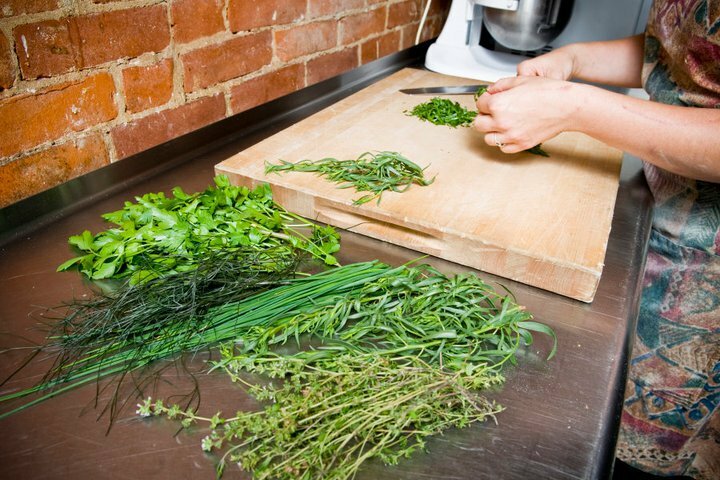 That being said, here’s one I stole from their Facebook page of some of the herbs that were used in the demos. I want to share with you her recipe for Chipotle Potato Salad for a couple reasons. First, as a general rule I detest potato salads, but I didn’t think this one wasn’t bad – which means if you normally like potato salads, you’ll love this one. Second, she shared her secret to perfect potatoes and onions. In a large bowl, mix your potatoes with 1/4 cup olive oil and generously salt and pepper. Place more olive oil in the sheet tray(s) you want to use and place in oven without potatos. — This recipe should make 1 full or 2 half sheet trays. Once oil is hot and shimmering, carefully pour potatos on tray and spread out. Return to oven and roast until potatoes are lightly browned. If you don’t have a convection oven with a fan, you will want to stir your potatos a couple times during this process to ensure even cooking. Meanwhile, prep onion by slicing in a bowl, and pouring hot water over it for several minutes before draining. This helps break down the fibers and remove some of the smell. Once your onion is ready prepare your dressing by mixing mayo, dijon mustard, cilantro, lemon juice, celery, paprika, chipotle powder, salt, pepper, onion and garlic. Add potatoes just as they come out of the oven and stir well. The heat helps the potatos absorb the dressing, at the same timme the skin from roasting helps the potatos hold their shape. *You can add hard boiled eggs to this dish for extra awesomeness.